How behind myself am I with writing this up? A long way. But mostly because I’ve been flying and flying. So this isn’t a trip report as such but a mega quick round up. 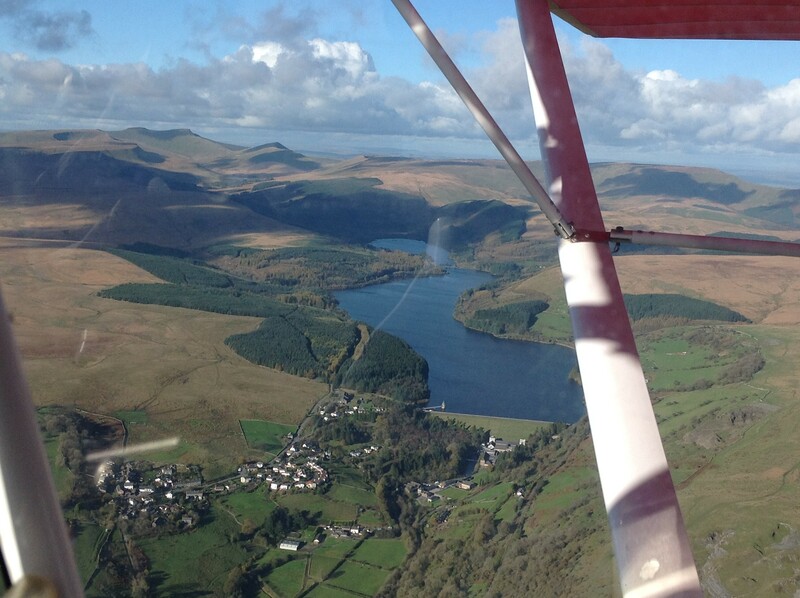 Got bounced all over the Welsh coast on the way to the newly reopened Llanbedr. 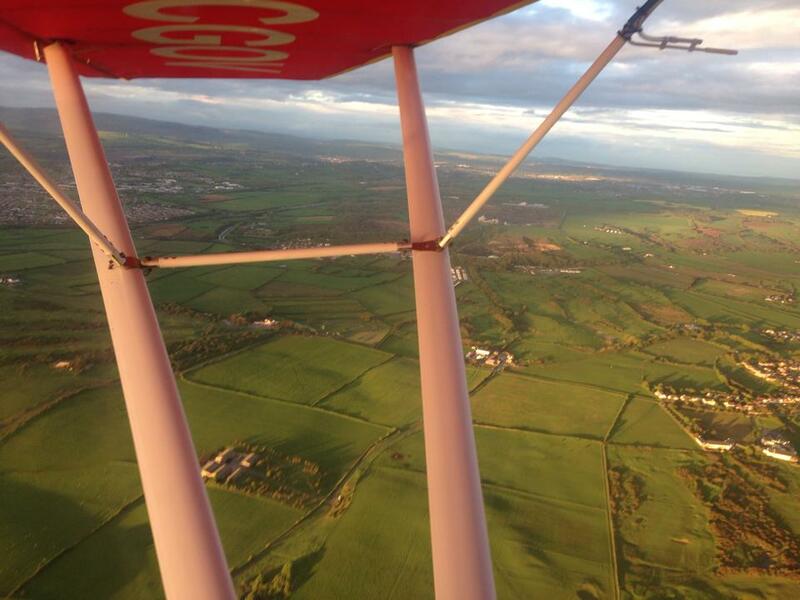 Sallied across the Bristol Channel down to Devon where I took my cousin flying and then spent every so long dawdling at Dunkeswell waiting in vain for the wind to drop so I could continue onto Belle Vue. Finally arriving after a conversation which ran roughly, “Well it’s still right across the runway but the whole field’s been mowed so just land anywhere”, which was what I did – arriving diagonally across the field into such a stonking wind on the nose I could have got out and walked faster! Been too heavy fisted with our fuel bulb and burst the pressure gauge resulting in a dial fuel of fuel and a puddle on the pod floor. Battled my way through the new EASA paperwork which should result in both an EASA license and a NPPL dropping through my door in the not too distant. Nothing particularly planned for a few weeks other than bimbling but we’ll see! This entry was posted in Flights, Wurbles on 7 July, 2014 by Leia. Pretty much the first nice day since the clocks going forward and amazingly we seemed to be the only ones there. The wetter weather showed though – walking the hill I could hear the land drains people have dug hither and thither around the hangars gurgling away. An odd, incongrous sound in the absence of any visible running water! But it was the only sound, apart from the bird calls and the clatter of wings as a buzzard took off at my approach round a corner of a hangar. Aeroplane tugged out and after a certain amount of coaxing to start the silence was broken by the mighty clatter of two stroke cacophany. Steve was along tonight and having jumped outto investigate the starting interruption walked up to the top of the hill where I collected him again and we went for a fairly aimless burble along the coast to have a peer at the new campus hurtling up there. 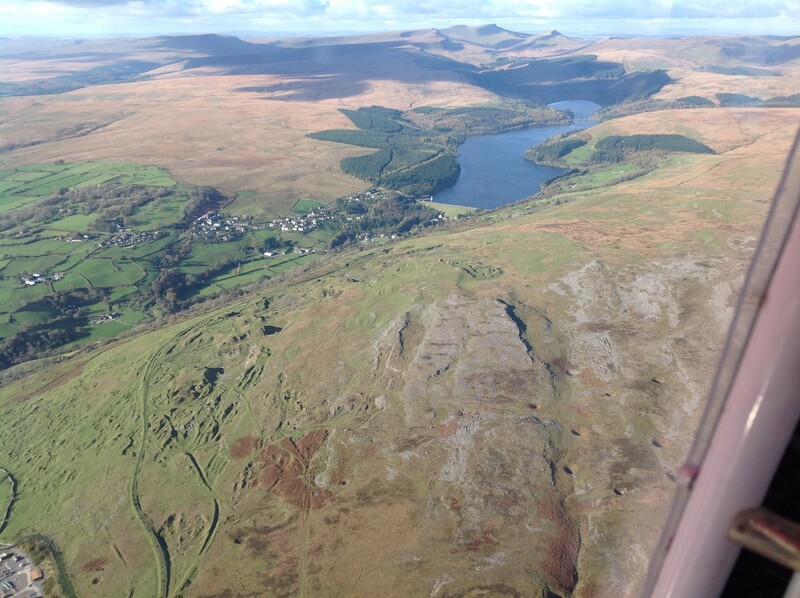 Then back over Neath, with a tootle around the fair a wave at a mate in a pub below and then a brief sortie up over the hills before tuning back for the coast – where up at still bone chilling altitude I showed of the X’Air’s silly but lovely utter docility at the stall before descending with an almighty sideslip. One of those evenings you can see every contour. This entry was posted in Flights on 15 May, 2014 by Leia. Belated both in the opportunity to take him flying and in the posting! The spring appeared to have finally arrived and in spite of a brisk crosswind the sky was cloudless and the morning warm. 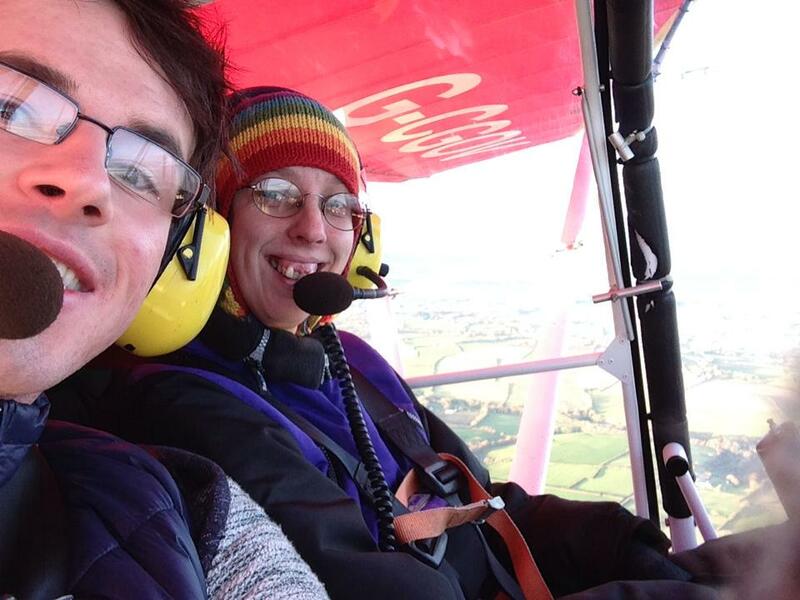 I’d arranged to fly down to Haverfordwest to finally take my oldest nephew for an X’Air trip and Nick was amenable to sharing the flying there and back so out to the field we went nice and prompt and early. 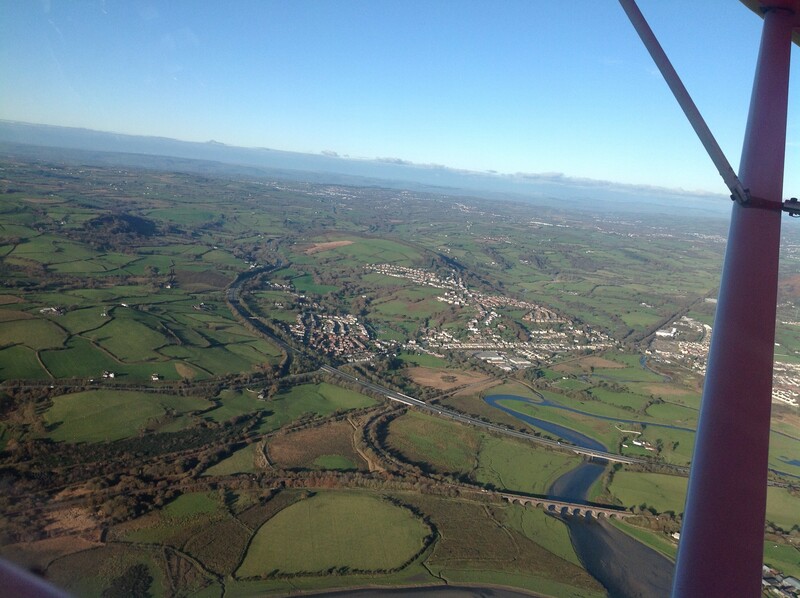 It was something of a surprise then to make an almost-second-thought call to Haverfordwest before leaving only to hear that they had vis of 8K and cloudbase at 800 foot. My bogglement must have been obvious even over the phone because they went on to explain that people had been calling up and turning back all morning. Pembrokeshire microclimate in full force. Rather nonplussed we debated what to do instead. Fly west? Gloucester again? Local? Eventually Nick suggested we phone Pembrey. If nothing else it would give us an idea how far west the clag started and whether it was worth waiting to see if it cleared. Pembrey was indeed clear and the new plan became, Pembrey, breakfast, then seeing if the warming day had shifted H’ford’s murk. Nick flew the first leg and as we bounced about over the trees over climate it became clear that the day was indeed not quite as benign as it’d looked from the ground. An ugly smear of inversion grey obscured the horizon and I was glad of the sunnies to add some filtering of the haze. We tracked north of the field and followed the coast around past Burry port while watching an aerobatic pair of RVs cavorting over the Loughor estuary. Being in the Pembrey circuit with my nose pointed at the castle always makes me smile on a return visit to where I first learned this flying lark and even in the murk and crosswind it was nice. A helicopter was our only companion in the circuit somewhere behind us. On the ground we were greeted by a friend of Nick’s but in the cafe suddenly realised it was Sunday and it was cavery or nothing. Being forced to scoff a full SUnday dinner however, was not exactly what anyone could reasonably described as a hardship and we were soon tucking in. After dinner entertainment was supplied by a rather foot stompy shouty R/C model flyer objecting to the helicopter being ‘low’ over the top of them. Me and Nick exchanged looks. Low? He’d been the same height as us to the extent that we were scanning left right and centre concerned about being on converging tracks. Circuit height at the absolute lowest. As dinner went down I tried Haverfordwest again. A few dawdled hours had made the difference and they were now under blue, if hazy skies, albeit with the wind bang on directly and symmetrically between all possible runways! This was my leg and I coaxed and caught the engine into clattering life to warm up before backtracking out to the end of 22. The haze was sufficient that I tracked due west until I could pick up the Haven and follow it north, rather than have a guess at the wind and spend the whole flight vaguely uncertain about when a familiar landmark was going to pop up. Not textbook navigating I know, but the slant visibility was rubbish whereas the sun was catching the Cleddau from miles and miles out and it was too tempting an easy target! I’m still not sure whether it was a gust or whether I just had been a bit early getting the crab off without lowering the wing properly but in any case what initially felt okay was suddenly a really rather vigorous nose up and rolling right kind of affair. Undoubtedly I should have gone around, and had started to reopen the throttle but instead I sort of ballooned yards along the runway and caught the descent rate in time to arrive with an undignified squealing of tyres but all parts still attached. Apologising profusely to both Nick and Rhubarb for the worst landing I’ve had in years, cross with myself that I hadn’t gone around, and aware it was probably more luck than judgement that I hadn’t broken anything, I decided instantly that today was not a passenger day unless the wind calmed down or came round really quite a bit. The ‘wall of noise’ in the form of the two oldest nephews and the only niece were shouting and waving from the fence as we went to say hello and extract the free landing coupon from its electronic form (I’d forgotten to get the paper one in advance). Haverfordwest never changes much and there was some catching up and chitchat about the weird weather to do before joining the others in the cafe garden for coffee and catch up there, where the kids seem to have appropriated Nick as an honorary uncle. By the time they’d told my everything about their week, and eaten (or not) chips and sausage and beans and pelted all over the garden it was time to make a go-no-go decision. The wind was no better in terms of direction but had dropped maybe five knots or so and was steadier. A certain number of pillows were needed to sit Troy high enough for the straps to be of any use and I got him secured before moving to the front of the aircraft to pull the prop through. The out we went. The ‘no talking’ doesn’t apply during taxy and he was awash with questions and comments. “Which way is Nana’s house on the map?” I asked, pointing out the airfield and Milford. Concentrating quiet ensued for a few second along with muttering and finger pointing around the edges of the map. I ran through the powerchecks before checking he was still happy and then out onto the runway and up. Rhubarb uses no space at all on tarmac and I could soon glance across to see all was progressing happily. Good word. It seems to be the favourite among younger passengers! “Where’s you school?” I asked. Hmm, yes I was hoping for more detail than that! “Is it near Tesco?” I seemed to remember this from the occasional ridealong on the school run. “I think I can see it.” I turned above the yard. his answer was a slightly doubtful yes, but I didn’t want to linger over the town so took his word for it. I flew in the indicated direction as Troy chattered about sheep (about a hundred in one field apparently) and windmills and what “might be cows”. 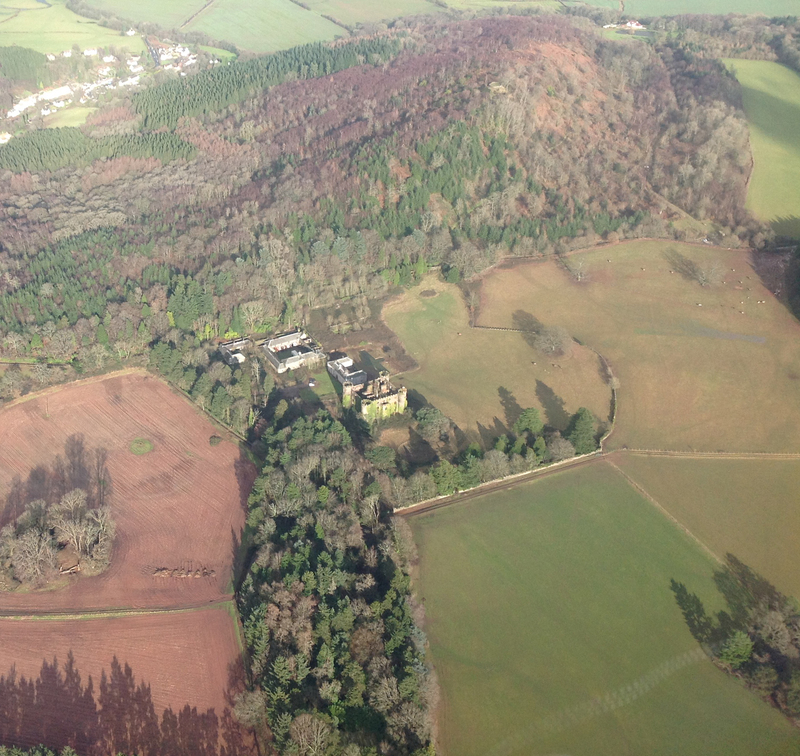 We circled briefly over my mum’s house and then headed back as time was ticking on. Once trimmed and pointing the right way and having discussed the direction again I gave him the stick to follow the river occasionally nudging at throttle or rudder to keep things from getting too out of shape. In fairness he had the hang of it fairly soon, and doesn’t lack confidence in correctly if he spots it banking when he hadn’t planned to. Back in the circuit and the running commentary (“Is that solar panels.” “I think those are horses” “I can see the windsock” “Is that a runway too?”) kept up until base leg where he observed The Rules and piped down. “It might be a bit bumpy over the trees” I warned him. I stayed a bit higher this time though, landing a shade deeper and with considerably less drama – though it still wasn’t ideal. I was left wondering whether grass is all that so much more forgiving of crosswind landings than tarmac or whether we’d had less crosswinds at Old Park than it seemed. Something to work on! We taxyed in and climbed out, all smiles. A quick refuel was briefly delayed when Nick had A Moment with the airside fence resulting in a minor loss of dignity and a certain amount of amusement for onlookers! 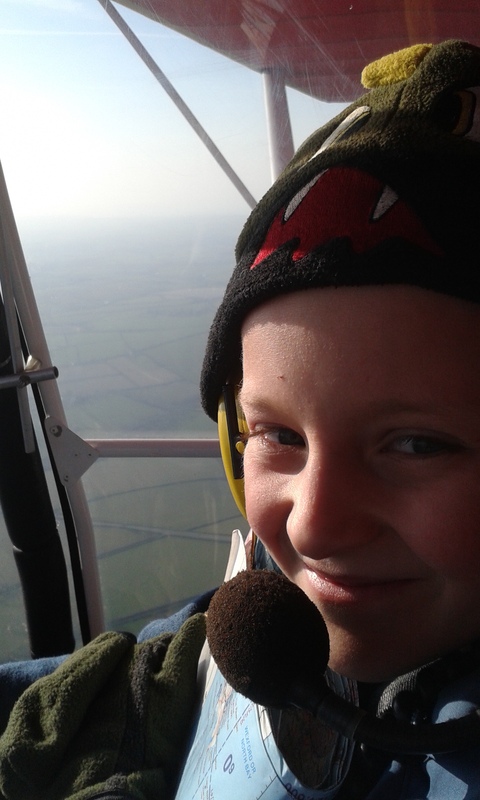 The smaller nephew was now dead keen to fly as well, so is on a promise! Nick’s leg again for the trip back so I enjoyed the view and the fact for the first time this year my toes weren’t actually numb with cold at the end of a flying day! This entry was posted in Flights on 21 March, 2014 by Leia. After weeks of wild and wet weather it was only the fear of the wind swinging round to a direction which would threaten our still partly open hangar that had kept me even glancing at the forecast. This week though there was a pleasant surprise and a distinct gap in the forecast. Sunday looked like it should be positively springlike! We’d been down the airfield on Saturday doing some pre-permit jobs on the aircraft including trying to fix the increasingly intermittent EGT gauge. This was an undignified process at best – I may have mentioned it before when troubleshooting some other item on the panel but getting under there to check anything requires lying half in, half out of the pod – backside on the seat, shoulders on the floor and feet hanging out, kicking in mid air over the strut. And then realising you’ve stranded yourself and ‘left your arms behind’ when really you should have should have got them in under there first… And now you can’t get even one hand past your own face without coming all the way back out again. In any case, Sunday looked highly promising and I’d soon jumped on the offer of a lift over from John, nice and early, since Nick was busy in the morning. Finally finally a nice crisp morning! Morning mist was lifting and the slight frost had at least hardened the runway surface slightly. We did a good search along it to check for windblown debris – there’s been a certain amount of damage to several hangars and one more complete collapse! A bit of jumping up and down and looking for wet patches left us fairly happy it was usable, at any rate for a little X’Air and the Skyranger. One of the QuikR pilots was also gearing up for a flit but John in the Skyranger was first off as soon as we’d got the utterly limp windsock up! I gave Gloucester a quick call to let them know I was coming, put a quick scribble of my intentions in the cabin logbook, then I was out and starting up. This took two attempts – I was a bit too quick coming off the choke. It was cold! I went to the beach before turning onto track, concerned that too early a turn would carry me over the one local we’ve been asked to avoid. I had planned an almost straight line, taking in a look over the strips at Abergavenny and Eastbach Farm as points of interest for a day when the ground was drier. 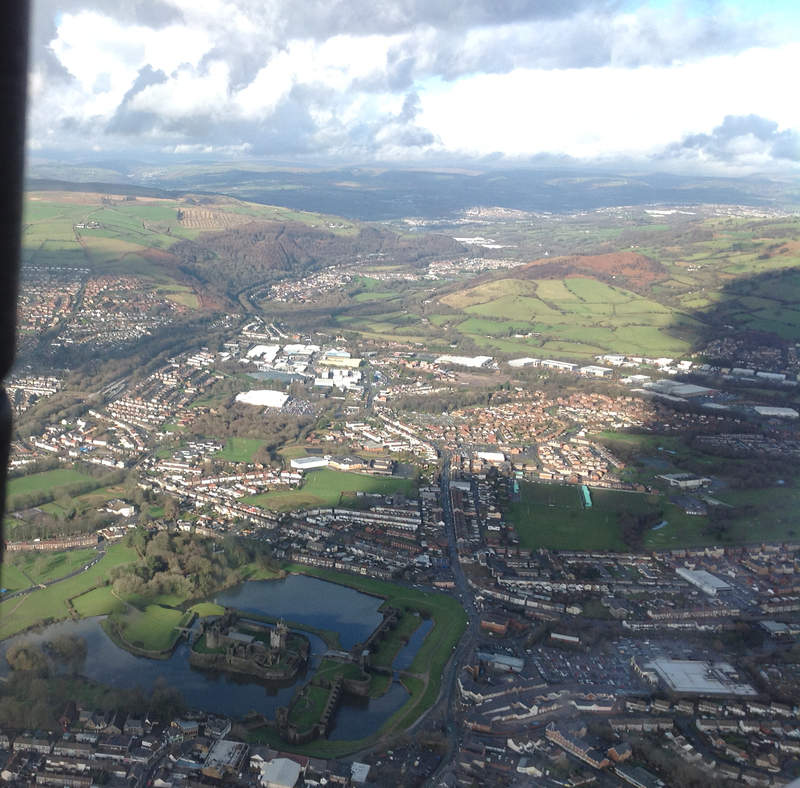 After a few miles and approaching Taf Ely, I switched to Cardiff and gave them a call for a Basic service. Radio was crackly today and they couldn’t really hear me well enough to want me to linger, but at least it was working more or less – they could hear me (at Readability 4 anyway). The airframe aerial is one of the ‘little jobs’ we haven’t done yet and the handheld is just using the rubber duck still. I checked the next frequency for Gloucester and scanned around the instruments – hmm. EGT has come partly back to life. Interesting. Still lower on the left by a hopefully unrealistic amount but definitely alive. Is it possible my replugging everything had worked and we just hadn’t got it hot enough on the ground to properly test? I returned my attention to the outside world, mulling this over. A few miles north east of Pontypridd there was a particularly fine open hilltop and I couldn’t resist seeing if it would make as good a forced landing field as it seemed. Gently closing the throttle and less gently lowering the nose to keep the speed up. No untoward wires or livestock in my choice of field this time, but still needed an almighty sideslip to be in with a chance (what little wind there was was across the field with hindsight). Remote enough spot to take it down below 100′ and I was fairly confident it would have worked. Potching after the fact with the track informs me the field I’d picked was 1.1nm from the track I’d been following and 2000′ below me. That is not a tremendously large amount of space and options! I climbed away and once settled back on track in the cruise glanced across the instruments again. Hmmm. I never know whether to be happy or not when things ‘fix themselves. Still. It’s working. Next waypoint was Abergavenny and I wanted to spot the strip not blaze over the top of it, so I was watching for the town and the road. I new vaguely from Google Maps what I was looking for – but was taken aback just quite how narrow it is – not to mention close to the trees that line the road! Possibly in reality it’s no narrower than Old Park and it’s the increased length that gives that illusion of course! I bore right and headed for Monmouth and from there the twists and curves of the river made Eastbach easy to spot, perched up on the hill with the forest beyond. Very attractive looking spot – definitely on the agenda for drier ground days. I dipped south around it, keeping it in sight though no one seemed to be moving there today. Really too wet perhaps. It was time to start thinking about talking to Gloucester and I located the ATIS and scribbled down the info before changing to Approach to listen out. No point calling until a lot closer with the rubber duck on the go and ‘five miles or five minutes’ are about the same at X’Air speeds anyway! I generally call around the ‘bends in the river’ and that landmark was about the last point where the river was still largely within its banks. Closer to the town it was extremely soggy. The airfield seemed largely unaffected though and the sun had brought everyone out – it was chokka block. I called up with just callsign and the ATIS (November) which reduced chitchat to the minimum, since all they needed was position, altitude and altimeter setting. The radio crackle seemed to have subsided anyway. 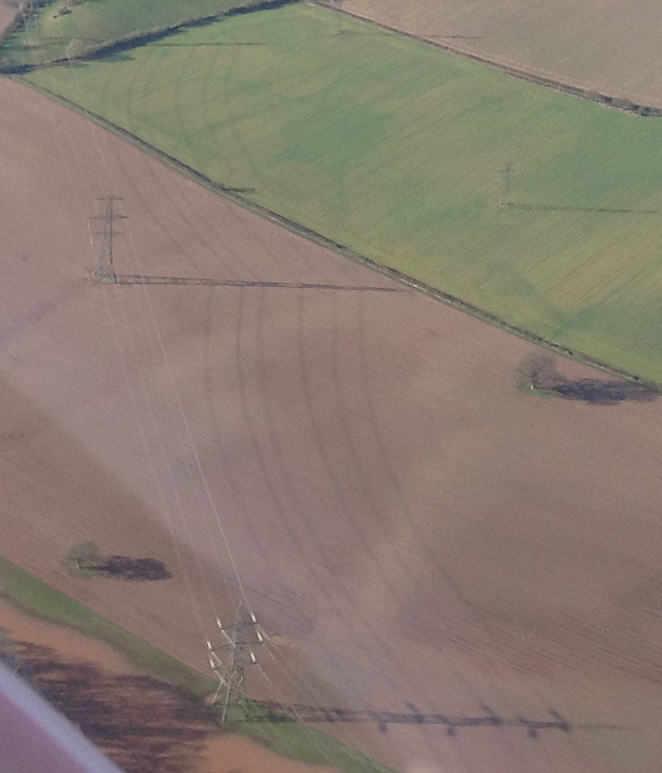 I was handed over to Tower at 3 miles and asked for the usual overhead join (22R). At some point in this process I managed to have a complete and total flashback and called in with one of the Swansea club aircraft callsigns (Bouncing BOMO!). Quickly correcting myself before too much confusion could occur, I carried out and was fairly pleased with the landing itself, though a bit more preparation on my part might have clued me that my turn the runway was miles down and I could have aimed rather further in! Quick request, got me directed to the Flying Shack which I’d heard a lot about but not yet visited. I paused on the taxiway outside. Had there been some discussion on a forum about wet grass? Hmm. Quick call revealed no problems with getting on the grass so I trundled on and turned round before shutting down and extracting myself to go about the process of clambering out of the “mobile-duvet” flying suit and stamping life back into my toes. Coffee was the most essential first stop so I headed inside, met on the grass by a Flyer forumite ‘morticiaskeeper’ who’d recognised the aircraft. I was soon introduced and suitably caffinated and the Shack living up to its friendly reputation. They sorted out the landing fee, showed me the briefing room for when I was ready to leave and after some chitchat, I was offered a lift round to the Jet Age museum where a friend from YES was, as usual, surrounded by excited kids. On this occasion, in the process of being helped in and out of a Hunter cockpit. One advantage of the failure of searching skills was that the queue of departing aircraft had largely dispersed by the time I arrived back and once I’d made my farewells and booked out, I only needed to wait for one landing aircraft before I could make my getaway. Before leaving I snagged some leaflets to stick up at Old Park – not enough people know how welcome the little ones like us are at Gloucester! Climbing out and pointing my nose to the west I took a last look at the flooded fields below – a line of pylons marched through the water, casting shadows even of the wires, sharp and clear on the wet fields. I took a more or less direct route home, but found it interesting looking at the track. You can almost see the thought bubble above my head as I dislike the forest beneath me and weave from gap to gap! The flight was slow into the headwind but the visibility had improved from the morning and I was making acceptable progress, with frequent checks on the fuel state at every likely diversion point. Gloucester is about the edge of the range if you want to land with 10 litres left (40 mins). On a windier day I’d have needed to partake of their UL91. I was just crossing the last ridge before the ground dropped to the sea and had turned to eyeball the fuel (transparent tanks behind the seat) when there was just the suggestion of a drop in revs. Not dramatic. But just enough to hear and not planned and ever so attention-getting. I spun back round from my craning to check the fuel one more time, my eyes flying from the RPM gauge, to the instruments, to the field I’d had my eye on a few minutes ago, while my hand leapt to the throttle. Which is when I realised that of course I’d just elbowed the flipping thing while twisting to check the fuel hadn’t I! Muppet. Well that got the adrenaline flowing nicely for the last leg anyway. I detoured to the beach for neighbourliness and finished off with a slightly fast and flat but gentle enough landing. Nick was already waiting to grab the fuel can and get another flight in himself so I didn’t even had to faff putting the aircraft away. Lovely! This entry was posted in Flights on 20 February, 2014 by Leia. I’ve been waiting for decent weather and enough daylight to go somewhere and today looked almost like a day for sallying away. Except for a weather forecast that includes intermittent showers and big clouds and a front which disappeared off the map between noon and six PM for no reason I could discern and was coming towards us in a way that was off putting. As the morning panned out the usual happy faffing and short hops meant it was half twelve before I was ready to start thinking about going somewhere in any case. I’ve been meaning to revisit Gloucester for a while. In fact I have an assigned ‘mission’ (read ‘excuse’) which requires a visit. Another hobby to flying is geocaching (sort of a GPS treasure hunt for boxes of swappable trinkets) and the last time I went out with some family we found a ‘travelbug’ which is trying to wend its way back to Staffordshire. Investigation revealed a handy airfield-accesible cache at Gloucester so I need to finish a flying visit with some grubbing under hedges for what the kids call “hidden treasure boxes”. 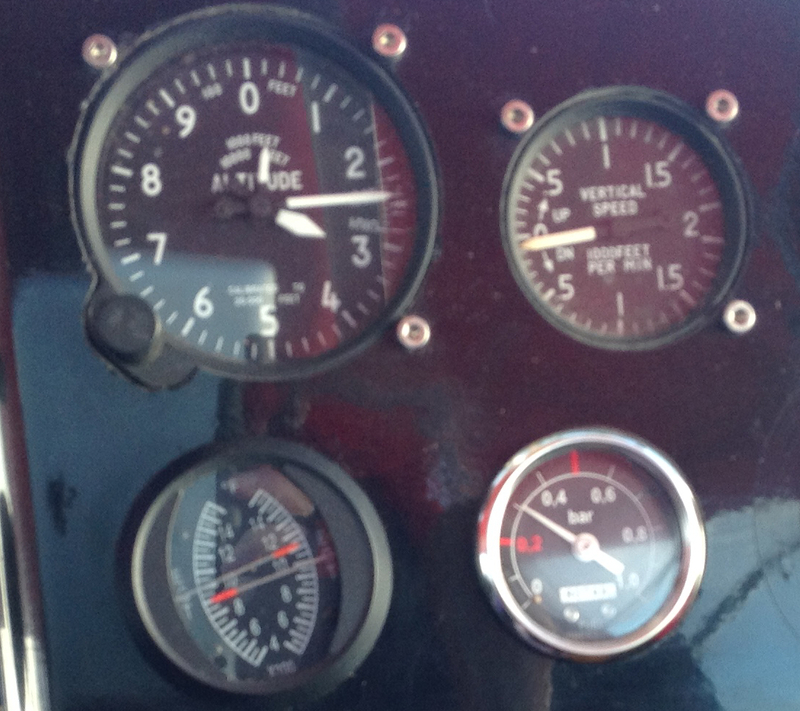 I decided I’d fly east in any case and see how the fuel consumption was. Time was not on my side for faffing about with jerrycans of UL91 the other end today so I’d head on and land only if I could get comfortably back without refueling. And going east then north would give me interesting things to look at even if I didn’t get allthe way to Gloucester. The wind was a bit flustery and mainly southerly which was nice for takeoff but’d mean a tailwind for landing back at Old Park. Nick had already go around once, (amid a flurry of birds as well!) so it’d require bit of concentration. But Gwyn, one of the other X’Air crew at the field (as well as former TOMS partner!) was already up and it hadn’t looked too alarming. I contemplated the choke for a few seconds (Nick has not long landed but it was hot hot…) and juggled things to life. Takeoff was both brisk and bespattered with mud and I blessed the little X’Air for being so utterly indifferent to the foibles of farmstrip operations! 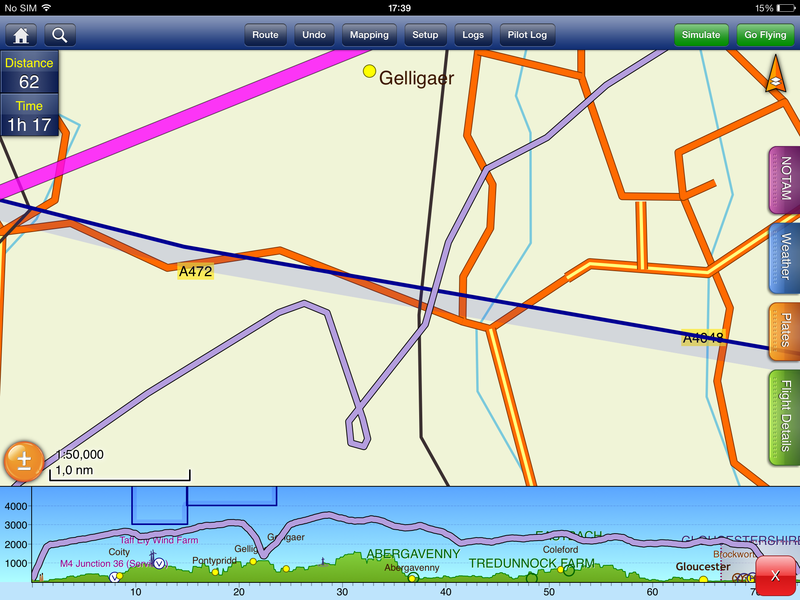 I headed vaguely north east seeking Taff Ely windfarm and the edge of the lower base of Cardiff’s airspace. I’d a mind to doing some flying around the edge of Cardiff. I’d promised to take a TA from a school in Canton flying and wanted to see if I could spot the school. Maybe on the way back. For now I stayed north, heading around Caerphilly to admire the lovely castle with its elaborate moat system. A few minutes later and heading vaguely for Newport to look at interesting and pretty bridges while working my way generally east towards the Severn. Well that’s odd. I thought I was pretty good on castles in Wales but I didn’t know this was here. 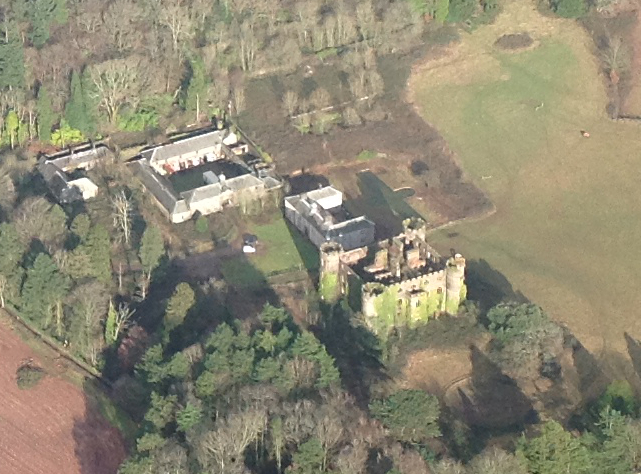 It’s clearly been added to a lot later with extra building development, and are those the remains of formal gardens? A pretend castle? A almighty big folly? Almost certainly not the medieval square castle it mimics. 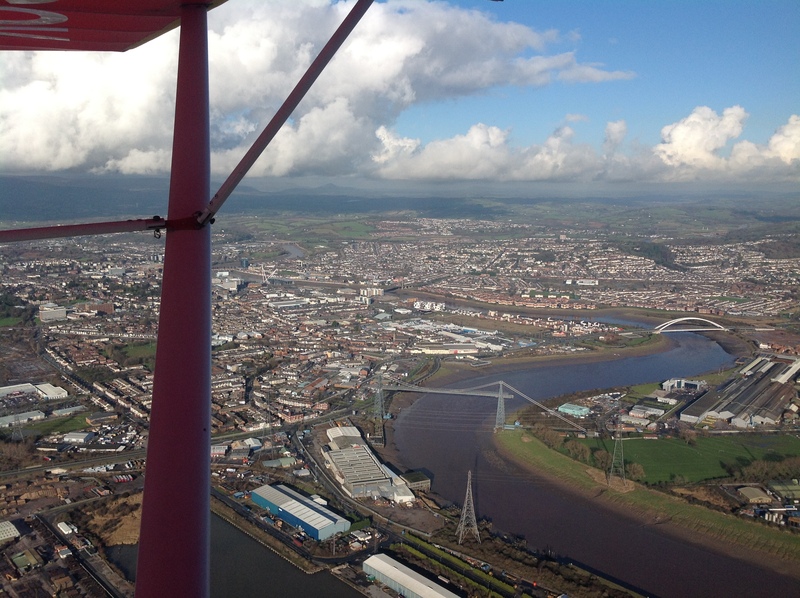 I any case, after a nose, I flew on to Newport going south of it for a change, and getting a great view of the transporter bridge. South east of the town I checked fuel and time and decided that I’d probably come far enough. I twirled through a few steep turns just because then, took advantage of the low lying open areas to do a few PFLs before turning back. First looked good but I spotted cows in my chosen field at around 300′ which I didn’t want to upset for no real reason, so climbed away. Second one went to 50′ by dint of an almighty sideslip to stop overshooting and the third I knocked off at 500′ after belatedly spotting wires. I need more practise choosing fields! Did a few stalls just for practice – not that the X’Air does much. Even holding it stalled it just sort of wobbles downwards. But I played about slowly slowly for a while. I’m much more used to the feel of it at the slow and fast edges of the speed range now and it’s enjoyable. I had missed that after years of the Tomahawk, that natural comfortable familiarity in the air with a particular machine is starting to come back and it’s lovely. Heading back towards Cardiff it suddenly occured that things had gone a bit quiet while I’d been absorbed with the handling. The radio appeared to have turned itself off. Hmm. A prod on the power button didn’t help, but reseating it in the power pack thingy did. Must have dislodged something while disporting myself under the guise of ‘practise!’. I skirted north around Cardiff as I headed back. Didn’t really find the school I was looking for (too far north) but I hadn’t flown much close to the city and it was fun. Back over the windfarms, turning at a sufficient speed to give me a clue that the landing would require some concentration. I was coming from the wrong direction from our new routine of a left basedf join to avoid a noise sensitive neighbour, so headed out to the beach before doubling back on myself to join by by usual route to the M4 elevated section. I certainly was moving fast on final! The rate of descent needed to be fairly high to not get swept past the field and it was hard to focus on the right airspeed with the ground cues saying something different. Second sideslip of the day put me back where I needed to be though and while the landing was longer than usual it was still a case of needing power back on to get up the hill rather than brakes to stop! Perfect machine for the job! Even if I did now very much need a warming cup of coffee and some major mud removal! Really must must land away soon though! This entry was posted in Flights on 21 January, 2014 by Leia. First properly sunny Saturday of the year, so there was no doubt about where we’d be heading! We were met by a pair of rogue sheep wandering the field but the sock was flying, and as we wiped away the dust and dust and insect life and general clutter of weeks and weeks worth of bad weather, we paused to watch someone else already aerobatting overhead. As Nick refuelled, I investigated the new hangar door which since our third member has had an unfortunate garden incident involving a broken wrist, has been completed (to our mixed gratitude and mild chagrin) by our hangar-neighbour Stuart. Easy, and light enough for even me to handle alone! Proper job! A heave out onto the grass a thorough walkaround ,and Rhubarb was ready to go. I wandered up the hill to sign up out while Nick warmed her up before collecting me at the top. The sheep had vanished, either rounded up or wandered back where the came from, so we didn’t delay in heading off. “Round Gower?” Nick suggested, but we were quickly tempted up over the hills, standing so bright and clear to the north, so it was off to twirl about over reservoirs and windfarms turning lazily in the breeze, and up to the scattered clouds. At least until our fingers went numb – I’d kitted up in suit and hat and new thermal socks but left my gloves on the ground! I was soon sat on my hands to warm them while Nick flew back down to warmer altitudes! 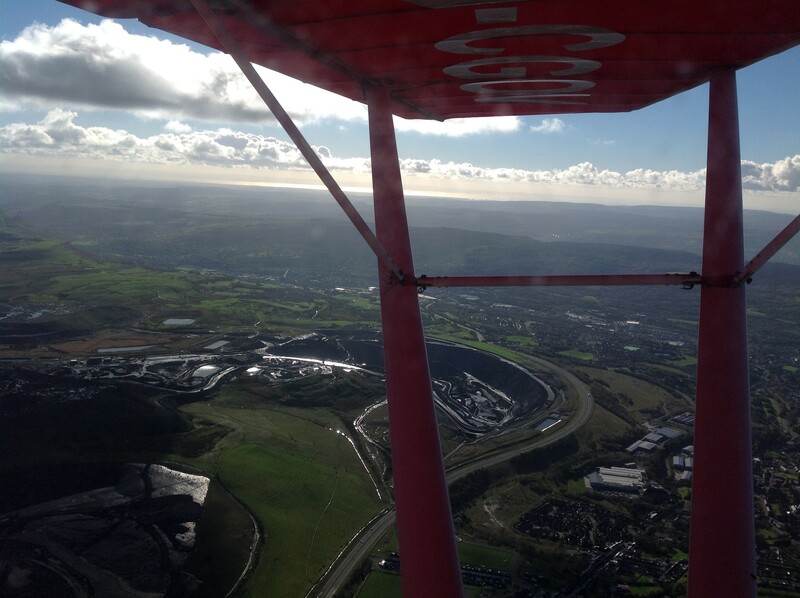 Back over Swansea and tracking the bay eastwards we were joined then soon overhauled by local gyro. Unable to give in quite so easily Nick opened the throttle and caught back up, at least for long enough to snap some photos and exchange waves before he dived away. We weren’t the only ones enjoying the weather – the bay was dotted with little sail boats – not to mention a huge ship with a pair of tugs and the pilot boat in close attendance, and weaving around them all a pair of jetskis. Looked much safer to be up here in the sky than down there on the water! Then it was back to the strip, and a refuel for my benefit before Nick head off to Cardiff and I drank coffee and had a chat and decided where to fly that afternoon. With Nick heading off, the conversation turned to how I was getting back. I assumed this was the usual a puzzler that I fly but don’t drive but it turned out that Phil-with-the-Starduster was dropping the aircraft off to Swansea and was after someone to drive his car over to meet him. I flicked over to Swansea radio and had been listening sometime mildly puzzled by a) the lack of traffic chitchat on such a sunny day and b) the outburst of static, when I realised I’d poked in 119.17 instead of 119.7 – finger trouble! (It’s always the radio that goes to pot when I’m rusty! Now on the right frequency I regained some time by making a slightly more direct join than Phil, slotting into the circuit downwind, and ending up second to him (and third to the Raven aeros lot who’d been looping their way into the circuit when I changed frequency. The landing, after the longest lay-off since getting the share was a furiously focussed affair, but rewarded with a really rather pleasing touch down. Pity I forgot to call final – see radio + rust! Phil was busy with the firecrew arranging aircraft in the hangar to find a space so more chat was in order while that was sorted, before heading back out to the parking spot, miles (it seemed) down the hill – everyone was flying today! Raven were off again and, with a quicker warm up than me, we let them go first while I did the guess-and-fiddle palaver with choke and throttle that the sort-of-warm engine required to coax it back to clattering life. Starts lovely cold with full choke, lovely hot with none, but at the inbetweeny sort of temps I only ever seem to manage around 50% of my first attempts! On this occasion though I managed to catch and keep it and used the warm up time to give a quick brief to Phil. “if you don’t like anything I’m doing tell me, I promise I won’t throw a pwdu” version of CRM. Phi happens to be an instructor, but I’ve always said the same to any pilot – hopefully helps avoid any ‘should I mention…’ moments, and gets an extra pair of eyes and another brain on side. Out to Bravo for powerchecks then a short wait while Raven Formation headed off together. With one other aircraft turning base by the time they’d lifted I decided to go ahead and go from the intersection. Ground run is always short on tarmac and we were turning crosswind by the time the one on base (one of the school Tomahawks) was touching down. Another bout of intense concentration on the landing – would have been typical to have a lovely one solo and then slap it down in company – but no, another respectable effort, thank goodness! Even on the centreline. Perhaps that should be my new year’s resolution. On the centreline! The sun was just on the horizon as I gently edged down the hill, dabbing at the brakes to prevent the momentum building up on the steep bit. And of course Phil ran me home, averting a wait for the bus! Successful start to the year’s flying all in all! This entry was posted in Flights on 13 January, 2014 by Leia. 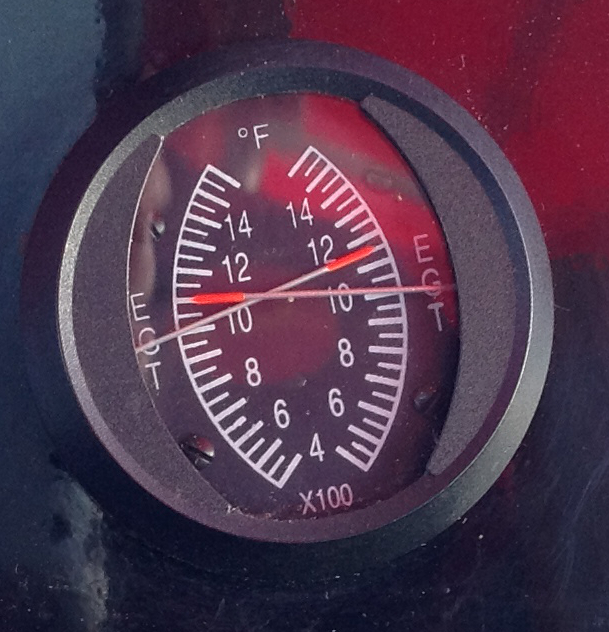 The cold has well and truly arrived, even through lexan the sunshine is not longer even remotely warm. But the engine loves these cold, dense days and my “mobile duvet” of a flying suit which was a birthday present back in August has finally come into its own of course! And, we’ve lost only a few days to foul weather – chiefly my annual leave unfortunately and the shorter days have put my travelling plans on hold for a while. Two weekends ago on a solo foray I headed out to the field with intention of giving Gloucester a go. It’s a distinctly brisk walk from the bus stop these days but the sky was gorgeous blue and the buzzard who must live near the field and whose feather we sometimes find between the hangars was crying overhead, perhaps hunting mice in the stubble and it seemed a very promising day to be up there too. Phil with a Skyranger from up the hill was around but sounding terribly faint on the radio as I taxyed out to go. With hindsight the handwaving he was giving me over this should have caught my attention more. But it didn’t so off I sallied, all weathered and notamed and planned, right up until I flicked from SafetyCom to Cardiff to hear nothing. Didn’t even get as far as speaking because the nothing was so obvious. Surely surely the rubber duck antenna couldn’t have gone as well. Not after the first two fixed ones did? Too much of a coincidence. So I potched vaguely for a few minutes power cycling and plugging things in an out to no avail. Gloucester is a bit big to pitch up non-radio without warning, so I threw that plan out, turned the radio off and stooged north towards the hills instead. Pity about lunch, but It was still a pretty day! Clear winter-sky vis threw the Beacons into sharp focus, the low sun and long shadows, casting the whole world in brighter deeper colours. In modern, unpoetic prose, it was like flying through a living Instagram filter! I thought about tracking up the reservoir and flying further north to those high and lovely and tempting hills, to wind among them. But to be sensible it’d mean climbing and I was already breathing clouds of steam. Half reluctantly, half eager to be warmer I turned south and descended. 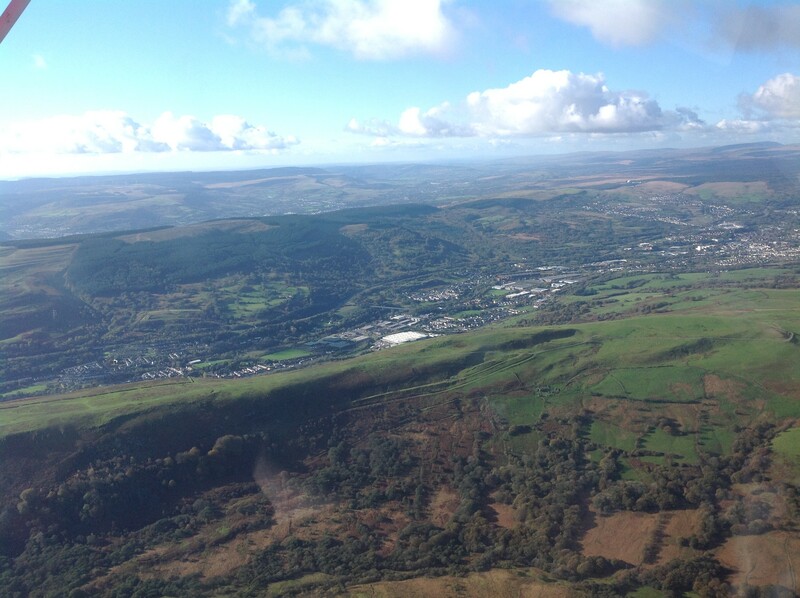 Aberdare, Maerdy, and down to the windfarms of Taff Ely before turning back west. Warmer now and with time to spare since I wasn’t having lunch out, I opted for a few PFLs, giving several a go between Bridgend and Porthcawl before finishing up at the beach south of the strip aiming for a particular patch of sand before climbing back up to head for the strip. Oddly the beach was the one where I nearly missed even my imaginary field and end up slipping like mad to lose height. Back at the strip I drank two coffees on the trot to warm up before addressing myself to the radio which turned out to be a simple loose connection I must have caught or kicked that morning. The next decent day I’d a Facebook message, suggesting heading down to Rosemarket. Nick was flying the outward leg today and we hesitated, having had a less than warm welcome last time. Nevetheless off we headed after a quick test flight to check the wings were still on (we’d used one rainy day to re-tension the skins) and throw some more fuel in. I phoned for PPR debating whether or not it would seem rude to ask to take the name of the person I spoke to, bearing in mind last time but decided against as they seemed content enough. We skirted the north of Swansea (not enough green bits there to comfortingly believe in “glide clear” at any reasonably warm altitude over the city itself today!) and then picked up a direct track. Vis was great again and the engine does love this cold weather – in fact the coolant temp was slightly too low – bit more tape needed on the radiator for next time! Nick arrived overhead gave the strip the prescribed buzz while I watched for golfers and the windsock – which said we wanted the other direction so back on ourselves we went and touched down to leaping and waving from my wall-of-noise-nephews! Very quick coffee, nephews in and out of aeroplane and time to go. But not before Nick had been harangued again for lack of PPR which I had in fact got. So the choice is top secret recording app on phone, or cut our loses and fly somewhere else from now on. At Rosemarket, it appears either our faces or our flying machine no longer fit. Pity, since it was always one of the places I’d looked forward to visiting while I was learning, and I’ve been often since then and have some fond memories. But good weather days are too rare to spend being scolded so elsewhere we’ll be going from now on. My mum’s fish have been adopted by the Tower at Haverfordwest – maybe we’ll go there and visit them instead! I was flying back, so after extracting the boys from the aircraft and doublechecking both fuel and sunset at this tail end of the day, I started up (after a bit of coaxing – the engine wasn’t quite cool enough to want all the choke I gave it on the first attempt) and taxyed out. The chilly easterly wind at least meant we were already pointed in the right direction for a rapid retreat and after turning back just once to ‘wave’ the wings to the boys, we were off. I skirted the coast, past Pembrey, and switched frequencies to Swansea in time to hear our new hangar neighbour aloft in her newly arrived ‘Muttley’ Skyranger (There’s a positive flock of them at Old Park now!).. I tracked up Loughor looking for a good spot (lots of green bits), north of the airport to cross Swansea and pick up the coast, eventually flying south over the uni and following the curve of the bay, a wingtip tracking the coast until past the steelworks for a gentle descent into Margam and home. Sometimes I don’t mind winter flying at all! This entry was posted in Flights on 27 November, 2013 by Leia.